Those who know me hear me say the word “reinvention” quite often. It’s a core characteristic for me, both personally and professionally. Don’t get me wrong – it’s not rooted in being unsatisfied. Quite the opposite – it’s rooted in the need to evolve and constantly learn new things. The idea of deconstructing a recipe in itself is inspiring. Love it or hate it – taking a classic dish and turning it completely inside out by breaking apart elements and serving them separately in a unique way, is simply fun. Beef Wellington is a favorite, and I have to admit, this recipe came about in a haphazard way by actually ‘not’ having readily access to a key ingredient. Ironically or otherwise, that lack of ingredient (pâté de foie gras) was the very inspiration here. For the beef, I procured the most amazing local steak tips that were unearthly succulent and incredibly tender. 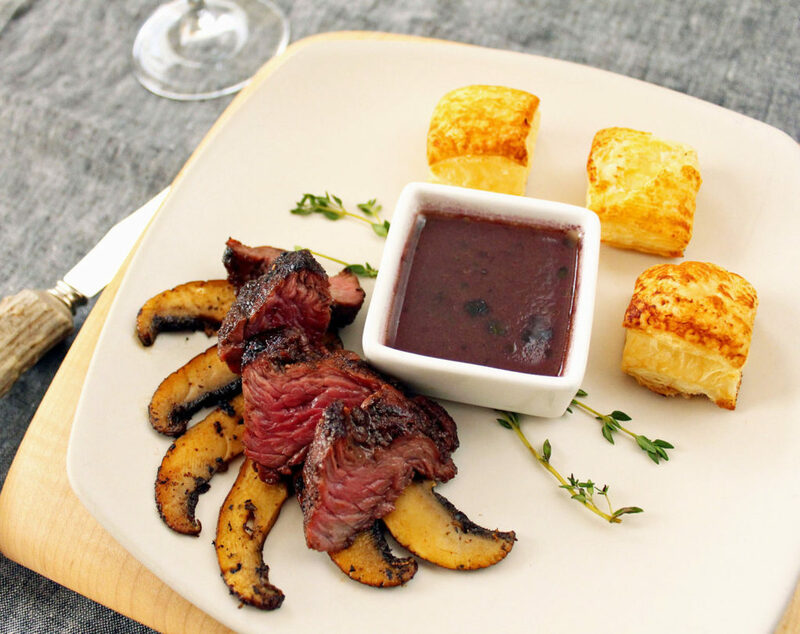 The delicate mini pastry cubes and lightly sautéed portabella mushrooms set the stage, and a simple wine reduction provided the juicy finish. My character will always be like this dish – evolutionary and never ending creatively reinventing. TIP: Don’t overcook beef. Most enjoyable served medium rare. In sauce pan over medium-high heat, melt 1 tablespoon of butter. Add shallot and garlic and cook for 2 minutes. Deglaze pan with brandy, and then add wine and stock and thyme sprigs. Reduce sauce over medium-high heat for 20 minutes. Remove from heat, discard thyme sprigs, and stir in remaining four tablespoons of butter. Season to taste with salt and pepper. Place puff pastry squares on parchment lined sheet pan. Brush pastry with egg wash and bake until golden brown, about 13 minutes. In a large skillet over medium-high heat, warm one tablespoon of oil. Sear beef on all sides to desired tenderness (3 minutes per side for medium rare depending on thickness of cut). Remove from heat and let rest for 10 minutes before slicing and serving. In same skillet over medium-high heat, warm one tablespoon of oil and add Portobello slices. Sauté until just crisp, turning to cook both sides. This entry was posted in Cooking, Main Dishes, Winter and tagged Beef by cfaust. Bookmark the permalink.